Along with this month's S.H. 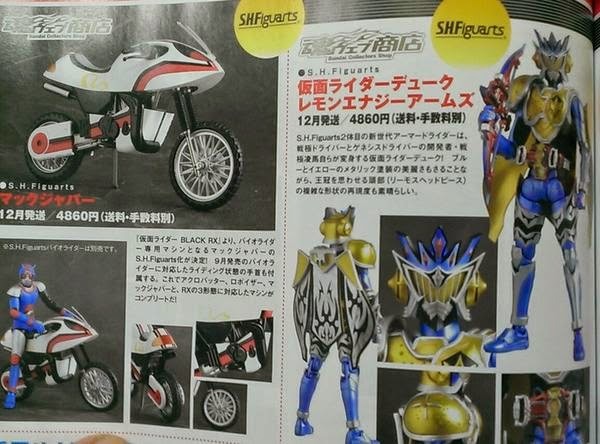 Figuarts announcements are Kamen Rider Duke and Bio Rider's bike the Mach Jabber. The S.H. Figuarts Kamen Rider Duke represents Ryoma Sengoku's armored form using the Genesis Driver and the E.L.S. 01 Lemon Energy Lockseed. From the scan alone, he will be inclusive of the Sonic Arrow and additional wrist replacements. The figure will be released this December 2014 as an exclusive for 4,860 yen. Aside from Kamen Rider Duke is the S.H. Figuarts Mach Jabber - Bio Rider's bike. The figure represents Acrobatter's alternative form when Kamen Rider Black RX becomes Bio Rider. Also a December exclusive release, price is 4,860 yen.